This weeks challenge over at the TSG blog (TSG205) is brougnt to us by Tangii!She has challenged us to make a card or project with an April Showers Bring May Flowers theme. You can use flowers, water or watercolor your image... use your imagination! I used the Poppies set. I stamped the image with Cocoa ink (Versa Craft) onto Rustic Cream CS, then heat set it. I watercolored it using some Distress Inks and a water brush. The sentiment was stamped with Jumbo Java ink (Versa Magic). The edges of the focal panel were distressed using a paper distresser and some Distress Ink (Vintage Photo). I paired it with some patterned paper from MME and added some jute twine and rhinestones. Head on over to the TSG blog for more info about the challenge and more inspiration from the other Trendsetters! 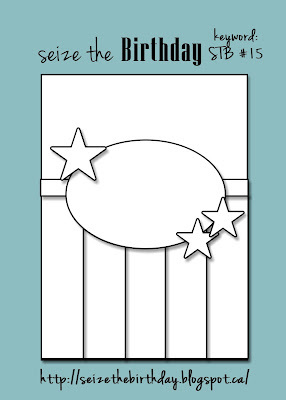 Today I'm sharing a card I made for the Seize the Birthday Challenge #15. Their challenge is to make a masculine birthday card using the sketch below. The clown image is a digital stamp from Birdie Brown (Clown - Balloon). I colored it with Copics and cut him out with scissors. Though it might be hard to see in the photo, I stamped a background stamp from Hero Arts in Soft Sand ink for the background. (A close up photo is below.) The patterned papers are from MME. For the embellishments, I used a couple of wood veneer stars (Studio Calico), some ribbon (PTI), and diamond stickles (Ranger). 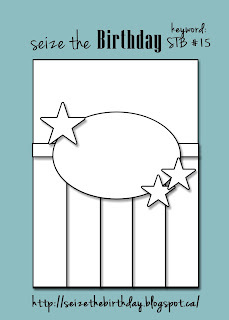 I'm also entering this card to the Digital Tuesday Challenge #207 - Birthdays. Thank you for visiting. Have a great weekend! Just wanted to join in this weeks one-layer card challenge over at The Paper Players (PP142). I confess that my idea for this design came from THIS card. Literally CASE-ed it! I used four stamp sets - The Doxie with Moxie (Cityscape, Streetlamp), Spring Fever (Bench), Numbered Days (Balloons) and For The Record (Sentiment). Please refer to the supplies list below for info about ink colors.